Gardening is one of life's simple pleasures. Even if you don't have a green thumb, digging in the dirt, planting and nurturing plant life fills a void in many people's lives. Some call it spiritual while others describe it as therapeutic or stress relieving. Indeed, planting a garden lets you connect with nature in a way that you probably crave, even if you don't exactly realize it. This is why many people find gardening to be addictive — in a good way. What starts as a few flowerpots on your patio may soon morph into a flower bed or raised vegetable garden. And that's just part of the fun. The opportunities, and the benefits you may reap, are virtually endless, from harvesting the literal fruits of your labor to creating habitat for pollinators and beyond. A study published in the Journal of Health Psychology tested the stress-relieving effects of gardening among 30 people.1 First they performed a stressful task, then were assigned to either 30 minutes of outdoor gardening or 30 minutes of indoor reading. While both gardening and reading led to decreases in cortisol, the decreases were more significant in the gardening group. Further, "positive mood was fully restored after gardening, but further deteriorated during reading." This suggests that gardening promotes relief from acute stress. 2. Reduce Symptoms of "Attention Fatigue"
It's suggested that people have a finite capacity for directed attention (the type required for sending emails, making phone calls, etc.). When this capacity gets used up, attention fatigue sets in and you may become irritable, easily distracted and stressed. When you immerse yourself in nature, including via gardening, you get to take a break from directed attention and instead engage in "involuntary" or "effortless" attention. "The breeze blows, things get dew on them, things flower; the sounds, the smells … All of these draw on that form of attention." According to a survey by Gardeners' World magazine, 80 percent of gardeners reported being "happy" and satisfied with their lives compared to 67 percent of non-gardeners.4 Perhaps it's no coincidence that gardeners are happier. Mycobacterium vaccae is a type of bacteria commonly found in soil. Remarkably, this microbe has been found to "mirror the effect on neurons that drugs like Prozac provide. "5 It helps to stimulate serotonin production, helping to make you feel happier and more relaxed. No wonder so many people describe their garden as their "happy place." In one animal study, mice that ingested mycobacterium vaccae had a demonstrated reduction in anxiety and improved learning. Collectively, our results suggest a beneficial effect of naturally delivered, live M. vaccae on anxiety-related behaviors … supporting a positive role for ambient microbes in the immunomodulation of animal behavior." A systematic review examined the impact of gardens and outdoor spaces on the mental and physical well-being of people with dementia. Gardening gets you up and moving about, which is beneficial on multiple levels. In fact, gardening can even be a moderate to high-intensity workout, depending on which tasks you do. Adding to gardening's allure is the fact that it represents functional exercise. Movements such as pushing, pulling, lifting and digging work multiple muscle groups at a time and keep you adept at the types of movements you need to function on a daily basis. Plus, gardening helps to improve balance, flexibility and sensory perception. Further, the extra nutrients you'll gain from eating your harvest of fresh fruits and vegetables is immeasurable in terms of its benefit to your health. 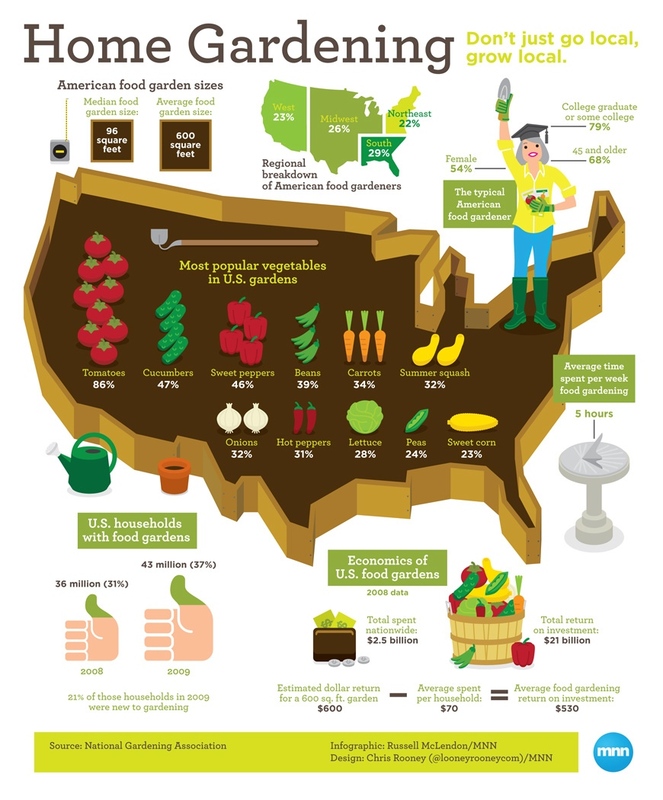 Not to mention, people who garden tend to eat more produce in general.
" … we can propose that gardens and gardening represent multidimensional phenomena in the lives of many older adults and it is much more than a physical activity in a designated space where time and energy are exerted for cultivating fruits and vegetables. … the added dimension of environmental connection and awareness into the experience of the aging process could serve as a template for a new "elder culture" and a sustainable future." "The guiding principle is that if we can get kids more engaged with learning, there would be a better foundation for academic success later on … Kids are more engaged in real world, hands-on learning, particularly at the elementary school level." Sprouts may be small, but they are packed with nutrition, including vitamins, minerals, antioxidants, and enzymes that help protect against free radical damage. They're an inherently cooling food and are perfect for adding to salads, either in addition to or in lieu of salad greens and sandwiches, and are especially tasty in combination with fresh avocado. You can also add them to your vegetable juice or smoothies. Better still, growing your own sprouts is quite easy, and you don't need a whole lot of space either; they can even be grown indoors. Two of my personal favorites are sunflower seed and pea shoots — both of which are typically about 30 times more nutritious than organic vegetables. They're also among the highest in protein. In addition, sunflower seeds contain healthy fats, essential fatty acids, and fiber — all of which are important for optimal health. Mung beans are another common sprout; they're a good source of protein, fiber, vitamin C and vitamin A.
Sprouts make an excellent introduction to gardening because they're simple and quick to grow. I used Mason jars when I first started sprouting seeds about 25 years ago, but I've since switched over to growing them in potting soil. Here's a quick tip. When growing sprouts at home, I first started out using a commercial compost, and my sprouts struggled to grow. I added biochar to the soil, and their growth took off. It was a shocking difference. Biochar is created by slowly burning biomass like wood chips, corn stalks, coconut shells, or any similar organic material, in a low-oxygen environment, such as a kiln, and it's a wonderful addition to your garden. If you're new to sprouts and aren't sure how to use them, try the recipe that follows — it's quick, healthy and incredibly delicious. Place sunflower seeds in a rectangular glass dish and place in oven to brown. About 10 minutes. Meanwhile, combine and mix all of the dressing ingredients in a separate bowl. Place the cabbage, spinach, sunflower sprouts, and cilantro in a large bowl. Mix with dressing and toasted sunflower seeds. Many gardeners start out gardening because they want to sample some homegrown food but end up sticking with gardening because of how it feeds their mind and soul. If you want to give it a try, the apps that follow will make planning your garden fun. This app (available for iPhones only) lets you take a picture of your yard then experiment with the look of different plants and trees. You simply drag and drop plants from a choice of about 20 into different places, and the app even lets you see how your yard will appear in different seasons. If you want to plant fruits and vegetables, sort through this database of more than 30 vegetables and 10 fruits. The app includes all the details you'll need to plant, tend to, and harvest your crops, including how deep to plant seeds and how much light each crop needs. This app has detailed information on more than 90 plants perfect for small spaces. You'll be able to pick the perfect plants for your climate zone and get step-by-step guides on planting and even much more (like how to lay down mulch). Picking perennials to make your yard bloom with color throughout the year can be overwhelming, but this app makes it a cinch. You can sort plants by height, spacing, colors, and more, and even find out what types of animals and insects different perennials attract. The app also lets you create combinations of perennials and see side-by-side photos of what they'll look like in your garden. Sprout It has it all — plant guides to help you pick what to grow, step-by-step growing instructions, cooking and recipe ideas for your crops, and ideas for different types of garden projects. It even works with your local weather information and sends you reminders about planting and watering. 1 J Health Psychol. 2011 Jan;16(1):3-11. 2 Am J Public Health. 2004 September; 94(9): 1580–1586. 6 Behav Processes. 2013 Jun;96:27-35. 11 Am J Public Health. 2011 Aug;101(8):1466-73. 12 J Aging Res. 2014; 2014: 283682. 13 J Sch Health. 2015 Aug;85(8):508-18. Previous Article Do Sleeping Pills Live Up to Their Promises?